The following article proposes a Vedic rationale for the nature and sequence of the twelve signs of the zodiac. It shows how the zodiac could have been invented as a form of Vedic sacrifice (Yajna) following the Vedic view of the Gods, the worlds and the elements. While the complete logic may not be worked out, enough has been revealed to show the probable main aspects of the system. Using this model many secrets of the zodiac are uncovered. The Vedas are based upon the concept of Agni or the sacred Fire. They set forth an elaborate Fire ritual (Yajna) that is identified with time (kala), causation (karma), and space. This ritual defines the entire cosmic order (ritam or Dharma). The ritual has several levels of application as elemental (adhibhutic), psychological (adhyatmic) and spiritual (adhidaivic). The elemental level reflects the Earth, the gross elements, and the outer form of the sacrifice. The psychological level relates to the Atmosphere or middle realm and to our inner faculties of mind, prana, speech, sight and hearing. The spiritual level reflects Heaven, the Gods or cosmic light forces symbolized by the Sun, Moon and stars. In the Vedas Yajna is identified with the Creator (Prajapati or Brahma), who through various Yajnas creates the world. Yet Yajna is also the activity of the soul (the individual human being or Jiva), who through the Yajna gains the fruits of karma as well as union with the Creator. These two, the Creator and the soul, are one as the Purusha, or higher Self. The Purusha is the universe personified as a human being, the cosmic man or person. The Purusha is identified with the Sun, who is time and the Kala Purusha or being of time. There are many forms of Vedic Yajnas. All involve various offerings of prayers, mantras, ghee, and food to the sacred Fire as it is enkindled at special times. They are defined as daily, monthly, seasonal, or yearly. Daily Yajnas relate to Fire and to the Earth, which is enkindled at sunrise, noon and sunset. Monthly Yajnas relate to the Moon and to the Atmosphere, particularly to the new, full and half Moon. Yearly Yajnas reflect the Sun, Heaven, the seasons and the equinoxes. The goal of the Yajna is to conquer these respective divisions of time in order to reach the eternal. This is also to conquer the different worlds or go beyond space. Performance of daily Yajnas takes one beyond the duality of day and night and the world of the Earth. The monthly Yajnas take one beyond the fluctuations of the month and the world of the Moon or the Atmosphere. The yearly Yajna takes one beyond time and all of its fluctuations symbolized by the year and the world of the Sun or Heaven. On an inner level these Yajnas take us beyond mental and emotional fluctuations to the equanimity of pure consciousness or pure internal light. Twelve day (dwadashaha) and twelve month (yearly) Yajnas were very important. Indeed the twelve day Yajna is said to be the most important of Yajnas, through which Prajapati creates the world. The zodiac may evolve out of the idea of a twelvefold Yajna, a yearly Yajna or the Yajna of the sky. However the most common set of Vedic Yajnas is the six day (sadaha) rite. Each month of thirty days was divided into five six day rites. The six day rites had both a day and a night. The zodiac could also be a six day rite, with two signs making for a day and a night. The first of the Vedic Gods, therefore, is Agni or Fire through whom the Yajna proceeds. Of similar great importance is Vayu or Indra, who relates to Air, wind, Prana or spirit. Indra is the foremost and most commonly lauded of the Vedic Gods. Once the Fire is enkindled, the second stage of the Vedic ritual is for the Air or spirit to manifest. The Fire moves up to Heaven and then the Wind descends from Heaven to the Earth. Agni (Fire) generates Indra or Vayu (Wind or energy). For example, the first hymn of the Rig Veda is to Agni or Fire and the second is to Vayu or Wind. Vayu is said to be Ishwara, God or the Creator, or the cosmic spirit, the evident or manifest Brahma (pratyaksha Brahma – Taittiriya Upanishad, Shantipatha), the formless Divinity. Agni is identified with the individual soul and the form aspect of Divinity. However the cosmic form of Agni as the Sun is identified with the Creator and the Supreme Spirit, who is also Vayu or Indra. Each of these two great Gods has its respective field of action. Agni is the deity of the Earth (Prithivi). He is enkindled on the Earth, in a specially dug Earth altar (vedi). The Fire burns the wood from the Earth. Earth is also the ashes (bhasma) left over from the Fire. Vayu is the deity of the Atmosphere (Antariksha), which is also identified with the Waters (Apas) or the Ocean. This is not only the field of the rains, but of the whole movement of Water from the Earth to the sky and back. The Waters also symbolize space, the cosmic waters. There are Waters beneath the Earth as well as above Heaven, through which Vayu moves everywhere. Vayu is the Lord of the ocean (Shukla Yajur Veda XXVIII.7). Indra’s main action is slaying the dragon who withholds the Waters to release them to flow into the sea. Putting Agni (Fire) and Vayu (Air) together along with their related support worlds of the Earth and the Waters, we get the four elements behind the zodiac – Fire, Earth, Air and Water. A Fire sign rests upon an Earth sign and an Air sign rests upon a Water sign, just as the sacred Fire relates to Earth and Wind to Water. Fire signs represent Agni (light) and Air signs represent Vayu (movement and order). These two are held or contained in Earth and Water signs, which they stimulate. Fire lights up the Earth and Air moves the Waters. The Vedas speak of a tripartite or threefold universe. Though there are various threefold orders in the Vedas the most characteristic is the three worlds of Earth (Prithivi), Atmosphere (Antariksha) or the Waters (Apas), and Heaven (Dyaus), adding the third world of Heaven to the other two worlds already mentioned. The God of Heaven is Surya or the Sun who can be identified either with Agni or with Vayu because he is the source of both light and life. Note the Brihaddevata of Shaunaka for a discussion of how the Gods relate to the three worlds. Agni and all the Vedic Gods, though they have their prime form in one world, have additional forms in all three worlds. Agni is primarily the sacred Fire on Earth. Yet he is lightning (Vidyut) in the Atmosphere, and the Sun (Surya) in Heaven. Each of the three forms of Agni has its Earth or world support which is its fuel, wood on the Earth, clouds in the Atmosphere and the stars in the sky. The three worlds of Earth, Atmosphere and Heaven are called the three Earths because they function as containers for the cosmic Fire on these three different levels. Vayu or Air similarly has three forms in the three worlds. In the Atmosphere he is the thunder, represented by the God Rudra (Shiva) and other deities of the rains like the Maruts. In Heaven he is associated with Indra, who is Vayu as the cosmic lord, and represents the solar wind or wind rising from the Sun. Vayu on the Earth is associated with the sacred Fire and its maintenance. All three forms are associated with cosmic law (ritam or Dharma), which is sustained by Vayu and its right movement. The three worlds are also called the three Waters or three oceans. Each form of Vayu is associated with a particular form of the Waters or the ocean. The Earthy or sacrificial form of Agni is associated with ground Water and with caves and springs and with the water and ghee (clarified butter) that is offered to the Fire. The Atmospheric wind (thunder) is associated the ocean and the rains which are created by Water evaporating from the sea. The Heavenly (solar) wind is associated with the cosmic ocean and heavenly Waters which are also the Milky Way. Space is the Waters of Heaven through which the Sun moves like a boat. The zodiac is based upon a threefold division of the four elements. Just as the Vedas have the four elements, they also have a threefold division of them relative to the three worlds. The threefold division of the signs reflects the Vedic idea of the three worlds of Earth, Atmosphere and Heaven and the three forms of Agni and Vayu operative within them. The zodiac follows a twofold division of odd and even or male and female signs. Fire and Air signs are all odd or masculine signs representing force or energy. Earth and Water signs are all even or feminine signs representing the field or world in which the force operates. In this regard in the Vedic view the day is Heaven and the night is the Earth. The day rests upon the night as spirit upon matter. Fire and Air are the spirit. Earth and Water are matter. However, the correlations are more specific. The Vedic ritual begins with Agni or Fire which corresponds to the beginning, birth, the eastern direction and sunrise. Therefore the zodiac should begin with a Fire sign. The Fire sign should be of a creative, moveable or active quality (cardinal or chara) in order to initiate the movement of time. This is the nature of the sign Aries. The qualities (cardinal, fixed and mutable or chara, sthira and dvisvabhava) of the other signs also become make sense according to Vedic ideas. Agni is enkindled on the Earth altar and so a Fire sign rests upon an Earth sign. This is the role of Taurus, which is associated with the ground and level places, as well as with wood and plants. Taurus is fixed (sthira) Earth, because Fire needs a continuous fuel in order to burn. The interplay between these two signs allows the Air or Vayu to come forth, which is represented by Gemini, the electrical force of the Atmosphere or thunder (Divine speech). Gemini is a sign of speech, expression and movement. The twins show the basic duality of the air or electrical force and its forces of attraction and repulsion. It is also a changeable, mutable or dual natured signed (dvisvabhava) because wind is never constant in its movement. Gemini represents Dharma or order in the atmospheric (and psychological) realm. An Air sign requires the support of a Water sign on which it moves. This is the role of Cancer as the moving (chara or cardinal) Waters. These are the Waters that rise from the ocean of Earth to the ocean of the sky and themselves make up the ocean of the Atmosphere. In Vedic thought the Atmospheric ocean encompasses Heaven and Earth on both sides and so becomes a symbol of the waters and the worlds as a whole, the world of origin, Cancer as the world mother. Vayu also is connected to the Moon and is said to be its protector (Rig Veda X.85.5). The second of the three sections of the zodiac begins with Leo which represents the Sun in Heaven, the heavenly form of Agni or Fire. The Sun is fixed (sthira) Fire because it gives light continually. Leo as a Fire sign is supported by Virgo, an Earth sign. Virgo is the Earth made fertile by the rays of the Sun. Virgo is sometimes portrayed as holding the stars, the field of the sky. It is a changeable, mutable or dual natured sign (dvisvabhava). After these two signs comes Libra, another Air sign, here the wind on the Earth. Libra is concerned with weighing and balancing, attracting and repulsion, the basic duality of Pranic or electrical forces in the material sphere. It is also a moveable, creative or cardinal sign (chara Rashi). It represents Dharma or justice, the order of the sacrifice, on the Earth level. In this way it is opposite Aries and reflects the second half of the zodiac and a parallel movement of the sacrifice. Libra is followed by Scorpio, here the ground Water or Water beneath the Earth or the Earthly ocean. This is fixed (sthira) Water because it is unable to move. The scorpion is a creature of holes and caves. Scorpio also indicates the underworld where the Asuras or anti-Gods dwell that the Yajna must destroy or transform. The Asuras are often placed deep within the ocean or in the depths of the sea. The third group of signs begins with Sagittarius, which is lightning in the Atmosphere. Sagittarius is a bow (Dhanus) or an bow and arrow. The bow is a symbol of the rainbow and the arrow of lightning. The horse, with which this sign is associated, is a symbol of Prana or atmospheric force. Lightning is associated with law and justice that this sign indicates. Lightning is mutable or dual natured (dvisvabhava) Fire because it is always changing. The atmospheric Fire or lightning burns on the Earth in the form of Capricorn. Capricorn then would relate to high places like mountains on which the lightning strikes. As the Earth activated by lightning it would have a more active or moveable nature (cardinal or chara). In Vedic thought clouds are also symbolized as mountains. Then follows Aquarius, which with its universal energy represents the wind or Air in Heaven, including cosmic law and the forces of time and karma. It is fixed (sthira) Air because it holds and sustains the entire universe. Aquarius is also the water pot, kumbha, that pours the Heavenly waters. It represents Dharma or justice on a cosmic level. It is followed by Pisces as Water or the Heavenly ocean, which represents the cosmic ocean that is the origin and end of all things. This is mutable, changeable or dual-natured (dvisvabhava) Water because it is not only the end of one cycle but the beginning of another. The Vedas reflect the idea of the flood or pralaya that ends one creation and starts another. That the zodiac therefore begins with Fire and ends with Water makes perfect sense. That is also why the Gandanta (transitional) points between Water and Fire signs are so dangerous. They are places of destruction and creation, Sandhi points, where energies are caught between fire and water. The Earth Fire or Aries relates to Mars, which in Vedic thought, is the son of the Earth (Kuja, Bhauma or Bhumi Putra). The Atmospheric Fire, lightning or Sagittarius relates to Jupiter, which in both Vedic and Greek thought is the God of the lightning, thunderbolt or rains. Brihaspati (Jupiter) is a God of the thunder and rain in the Vedas and with his lightning destroys the Asuras. The Heavenly Fire or the Sun, relates to Leo. These mark the three divisions of the world, time or the cosmic order of the sacrifice. The three Fires of Earth, Atmosphere and Heaven govern these three divisions. The Earth wind of Libra relates to Venus, which shows the forces of attraction and repulsion or Dharma in the material sphere. The Atmospheric wind relates to Mercury, which relates to electrical force, speech and prana in general. Mercury in Vedic thought is the son of the Moon (Saumya), which relates to the Waters. The Heavenly wind relates to Saturn, which creates space, distance and detachment and governs the movement of time behind the cosmic order, the heavenly Dharma. Saturn is the son of the Sun (Surya putra), showing his connection to Heaven. I am also attempting to relate these three planets with the three forms of Vayu or Prana. Venus is Prana or the basic life force. Mercury is Vyana or the expansive life-force. Saturn is Apana or the force of death. In certain Vedic teachings Prana is associated with Earth and fire, Vyana with the Atmosphere, and Apana with Heaven. Yet the middle world or Atmosphere as the central and all encompassing world is sometimes seen as the main or highest world, in which the order would become Earth, Heaven and the Atmosphere or the Waters, which follows more the sequence of the zodiac as Aries-Leo-Sagittarius. The signs come in pairs of opposites that shows the twofold movement of the sacrifice through fire and air. Fire signs reflect light. Air signs reflect movement and order. Their interplay sustains the universe. One of the problems of the zodiac is correlating the natural elements of the planets with the elements of the signs that they rule. All planets, except Sun and the Moon, rule two signs, a fire and a water sign, or an air and an earth sign. On the other hand, each planet rules an element by nature. Venus, though a watery planet by nature, rules an Air and an Earth sign. The Vedic system explains why this is so. The zodiac is reflecting the order of the Yajna, not that of the basic elements of the planets only. It gives each planet an element as spirit (masculine) and as matter or world (feminine). As Spirit all planets are either fire or air, which is the nature of Spirit. As Matter all are either water and earth, which are the material elements. The Vedic Yajna proceeds through various animals which symbolize various aspects of the cosmic order and different offerings into the sacred Fire. The last step of the process of creating the Vedic zodiac would be to ascribe specific animal images to these Vedic elemental and world forces represented by the signs. The Vedas record that when the Creator made the world he assumed the forms of five animals to reach the world of the sky (Shatapatha Brahmana X.2.1). The animals mentioned are the man, goat, ram, bull and horse, which contain several of the zodiacal animals. In fact the creation is the sacrifice of the Creator (Prajapati), who offers himself to himself in the form of different creatures. The bull (vrishabha) is Taurus. The horse (ashwa) is Sagittarius. The man (Purusha) is Aquarius. The ram (avi, also called mesha in the Vedas) is Aries. Aries is sometimes referred to as a goat as well, which is an animal particularly sacred to Agni. Other common Vedic animals include the lion (simha – Leo), the twins or Ashvins (Gemini), the scorpion (vrishchika – Scorpio), the fish (matsya – Pisces), the virgin or dawn Goddess who is the wife of the Sun (kanya – Virgo), note that Virgo follows Leo. Another Vedic symbol is the trader (Pani) who could represent Libra. Capricorn is sometimes called a crocodile (makara) or a deer (mriga). Elsewhere it is also called a goat, aja, or a sea-goat. The Vedic Waters or ocean can be Cancer. In other words the symbols for the zodiac are there in Vedic lore. One must note in this regard that the Vedic name for the stars of the Big Dipper, the rikshas, means bears, just as the Great Bear of the Greeks, showing a long tradition of similar constellation names between the Hindus and the Greeks. Vedic sacred animals are threefold as domestic (gramya), wild (aranya) and human. The zodiac follows a similar idea. Domestic animals include the ram or goat (Aries), bull (Taurus) and horse (Sagittarius), perhaps Capricorn (goat) as well. Wild animals include the lion (Leo), crab/shellfish (Cancer), scorpion/serpent (Scorpio), crocodile or deer (Capricorn), and fish (Pisces). Humans include the twins (Gemini), the virgin (Virgo), the trader (Libra) and the man or person (Aquarius). The Nakshatra system represents a twenty-seven fold Yajna. It is mainly a horse sacrifice, ashwamedha, with the horse as the symbol of the Sun and the horses’ sacrificed head marking Ashwini Nakshatra or the beginning of the zodiac. Horse, ashwa, is a symbol of speed, time, energy and Prana. The horse sacrifice is a yearly ritual with the horse as the Sun being released to roam free for a period of a year. The zodiac appears more like a Sarvamedha or universal sacrifice and is also a yearly sacrifice. If we count Aries as a goat, it would be a goat sacrifice. Aja, goat, also means unborn a-ja and refers to the reincarnating soul. The goat is the most commonly sacrificed animal. The horse sacrifice is preceded by a goat offering. Counting from Sagittarius as a horse and from the atmospheric Fire as the all fire, one could turn the zodiac into a horse sacrifice as well. The Yajnas are furthermore built as Fire altars (Agni-cits). The Nakshatra system is a twenty-seven fold Fire altar. The Rashis would be a twelvefold Fire altar. A key to the connection between Rashis and Nakshatras can perhaps be found in Harappan archaeological ruins. An Harappan seal dated to 2400 BCE has been found recently that shows a deer and an arrow on one side, the symbol of Mrigashirsha (Orion) and a Scorpion on the other. Scorpio is opposite Orion in the zodiac. When one rises, the other sets. S.M. Ashfaque has argued an astronomical basis for this seal (“Primitive astronomy in the Indus Civilization. In Old Problems and New Perspectives in the Archaeology of South Asia, ed. J.M. Kenoyer, 207-215, Madison, Wisconsin). Here we find one of the zodiacal signs emerging in Vedic thought relative to the Nakshatras. Perhaps the signs arose out of the Nakshatras or were already employed at that time as parallel system. 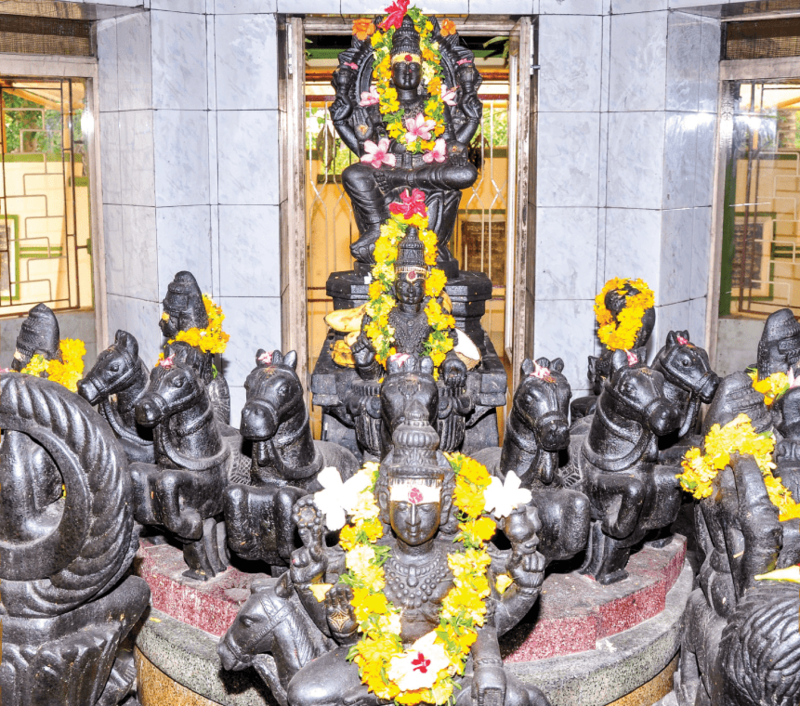 There is a clear connection between the structure of the signs and key Vedic deities and cosmological principles. The zodiac is just another version of the Vedic Fire ritual, which is also time and karma. Perhaps such a view produced the zodiac in the first place. The details are not yet clear but there is a Vedic logic to the signs that cannot be coincidental or borrowed from a foreign source. One may argue that such ideas were common in Babylonian, Egyptian and Greek thought, but the idea of the Fire ritual was nowhere as prevalent or enduring as in Vedic India. This information can be combined along with revised historical data that identifies Harappan or third millennium BCE Indian urban civilization with the late Vedic era. Such factors require an earlier dating for Vedic astrological knowledge and strengthen the idea that the zodiac has a Vedic origin or at least Vedic counterpart going back into the third millennium BCE. 0 responses on "The Twelve Signs of the Zodiac and the Vedic Fire Ritual"